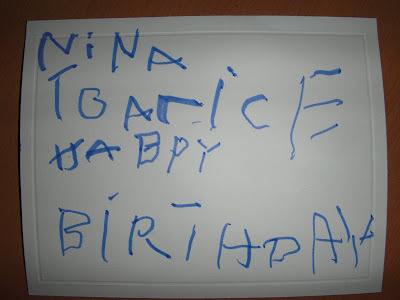 Actually, I think it's possible that her handwriting is actually better than Larry's. Take the zero-waste lunch pledge--pack only (or as much as possible) items that don't need to be thrown away. 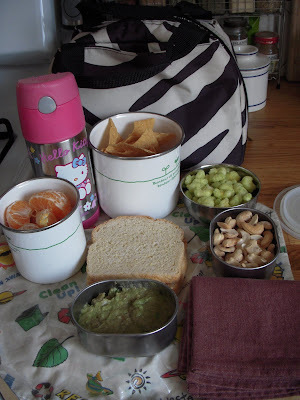 Check out Nina's zero-waste lunch here. Then go shop here for some supplies (or visit them at the Hillcrest Farmer's market on Sundays from 9-1). Maybe if I convert some other people I won't have to feel guilty about Nina's plastic wrapped fruit leathers that I sometimes give her. Oh my goodness, I love them, and I wear them every opportunity I get. I am very happy with my choice. I thought I had to wait much longer, the tracking said they wouldn't be here until the middle of the week. 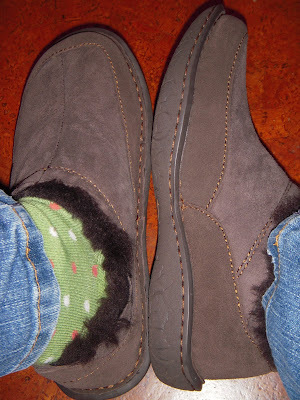 They're super comfortable and warm, very cute with my smartwool socks! I think I chose well. Now I'm eagerly awaiting the boots...the ebay seller said they went into the mail yesterday but they don't have a location in their profile so I don't know how long they will take to get to me. We had the honor of seeing Meg, Jonathan, and Jamie for couple of hours on Monday; they had a layover in San Diego on the way to Hawaii so I picked them up and we went to Spanish Landing playground and had some takout from Blue Water (best fish & chips in San Diego, in my opinion, the fish isn't deep fried and the chips are waffle cut). It was wonderful to meet Jamie for the first time, he is a very calm and cheerful baby. I dipped his toes in the Pacific, which he didn't really enjoy, it's super cold, especially this time of the year. Sautee onion/garlic, ginger, curry powder, and wild rice with shitakes. Add water, red lentils, keffir lime, lemongrass, fish. Simmer for a while, then add coconut cream/milk (enough to make it as coconut-ey as you like, then add tatsoi, corn, and whatever else you have in the fridge that might taste good. Simmer until wild rice is cooked (until you can see the inside of the rice, not just the black outside). Sorry I can't be more specific on quantities, this is a seat of the pants operation. I use lemongrass and keffir lime in a jar, they don't need t0 be chopped up this way (purchased at Whole Foods). So, I went shopping today with a friend who had a mandate from her husband to buy some cute new clothes--the rules were that the clothes had to be more than 20$ and preferably not on sale. We found a fab sweater that is comfy enough for home but cute enough to dress up and wear out (Anthropologie). Ditto for jeans (Banana Republic) and a shirt. And a super cute pair of shoes (in red). I was, of course, on the lookout for boots. I was surprised that I really didn't find anything to buy today. I tried on these and they were comfy but the folded down top doesn't roll up to easily fit under pants, and they were a little too ugg-ly. And I found the Borns from the previous post on sale for 70$...one size too big and in pink. They had these at REI but only in large size. And I found these...but only in a size 9. I really like them though, so I am going to try and find them locally. If I can't I will order them online. The toe is a little pointier than I'm looking for but otherwise they are perfect--classic and a little updated and warm, perfect for skirts. I forgot about these. I tried them on in a 5 today and they fit but barely and they were hard to get on. Here's what I'm thinking: I will get the Born Gabi (from the previous post) in chocolate and work on getting the Ugg Swell in Brunswick on ebay for a reasonable price. It has been quiet around here...I haven't been feeling well enough to keep my physical house in order, let alone my cyber house. But I went for acupuncture the other day and my practitioner said I shouldn't let me feet get cold. And they are, much of the year, despite my diligence in wearing shearling slippers at home and wool socks a lot of the time. 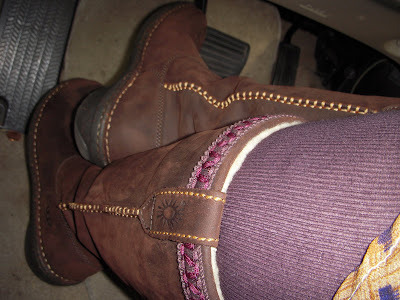 Soo...I am on the hunt for cute boots that will keep my feet warm. 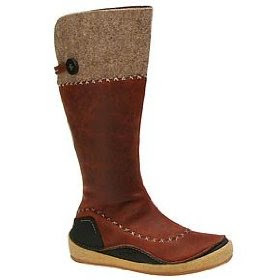 Here's the Sugar Hopstop Flat Boot--it comes in chocolate brown, which is what I would pick. It's faux suede, not sure how I feel about that--would it be warm enough? But definitely cute enough to wear with skirts. 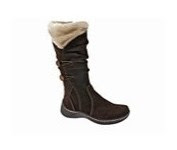 This one is the Bear Traps Esha Suede. The suede upper is not faux, but the shearling is. It looks comfy, no? Is the faux suede too much, though? I like the two little frog things on the sides. Too fussy for skirts? I don't know. 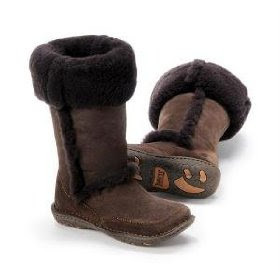 The Born Shilo...I'm really leaning toward these because of the warmth of an Ugg without all of the Ugg ugly (Sugar ate one of my Uggs, the bad dog). The folded down top rolls up for a few more inches of warmth. 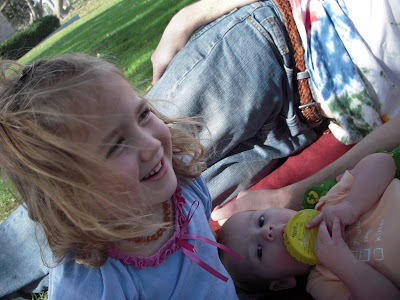 I know that Borns are comfy, too, it's a good, solid boot that will probably last me a long time. And of course that means they cost more than the previous two combined. I'm not nuts about the exposed shearling, though. Here's the Merrell Zurich--I'm not sure about it, but I know Merrells are durable and comfortable. These seem classic but also a little sassy. About the same price as the Borns. I'm also looking at the Born Atkinson (like that slight western styling) and the Simple Toemale. And if I wasn't looking for something I can wear with skirts I would think about just getting the Born Gabi...doesn't it look super warm? And of course it is supposed to be super warm this weekend. Figures. If you knit, you probably know what I'm going to say. If not, read on. 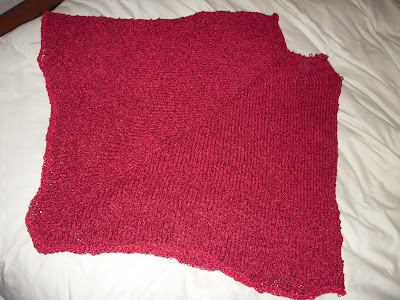 I knit a lovely poncho for Nina and when Franki was here the last time she told me that she loves ponchos too. So I offered to knit her one, which I did right away and had it finished within a week or two. But then I decided I didn't like it and unraveled the whole thing. 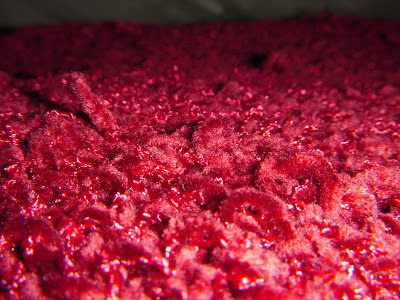 I've been trying to get rid of or knit up all the yarn I have so that I only have/buy yarn that has a specific project as its destiny, and in the process of taking stock I found the perfect yarn in my stash, red chenille that I plied with a lace weight red rayon boucle. It's gorgeous, as you can see. So, Franki: the question is really whether or not you can live with it like that. If not, I'll find another yarn. If you don't mind it, then I'll pop it right in the mail for you. Not to put you on the spot or anything.